Here is a free service that provides access to 300+ free online courses. The courses are related to Computer Science, Art & Design, Humanities, Business & Management, Education & Teaching, Health & Medicine, Engineering, Mathematics, Social Sciences, and Science. 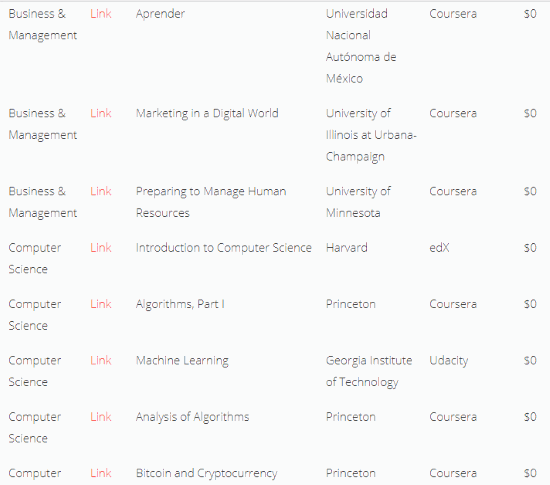 So, there are 10 different categories and for each category, a lot of courses are available completely free. The service that I have covered here is named “Free Online Courses” and the name suits it very well. For each course, a link of the source page is provided by this service. Thus, you can directly jump to that particular page where the course is available. The service doesn’t provide any course by itself. 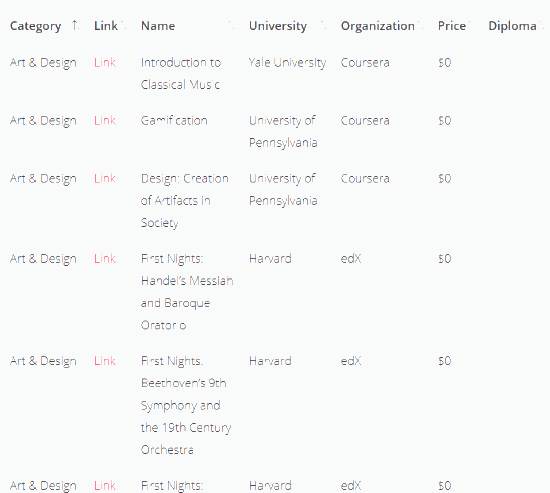 Instead, it simply helps to access the course page and provides some good details (like University, Course Name, etc.) related to the course. There will be a huge list on its interface where you can check the details related to individual course. The screenshot above shows the interface of this service where the course name and other details are visible. An option to submit a course is also there, but it jumps you to Qlearly.com website where you can take further actions to submit a course. How to Use This Service for 300+ Free Online Courses Related to Computer Science, Art & Design, Humanities, Etc.? This service doesn’t require any account to use it. All you need to do is open the homepage of this service. Its homepage link is added at the end of this review. Course Category: Art & Design, Mathematics, Science, etc. A Link to jump to the source page of a particular course. Course Price (that will be free). Name of the Course: Gamification, Accounting Analytics, Machine Learning, Applying to U.S Universities, Robotics, Health & Society, Moralities of Everyday Life, The Age of Sustainable Development, and much more. Effort: Time for that course. This information won’t be available for all the courses. Diploma cost for a course. Again, this information will be limited to a few courses. Check the information and then you can click on the “Link” that will open the source page of that specific course. On the source page, you can see the course rating, reviews, and other information. So, that is all about this website. Though the service is useful, it can be even better if it adds more courses from time to time. Also, it should provide some option to shortlist the courses so that the user can quickly access the list which is relevant to him/her. For now, users can open the source page and then bookmark it manually. There are many websites that provide educational videos and other stuff related to education. This service, on the other hand, has come with a different purpose where students can find 300+ free online courses for different fields. Whether you’re interested in Computer Science, Education & Teaching, Science, Mathematics, or some other subject, you will get different useful courses for free.